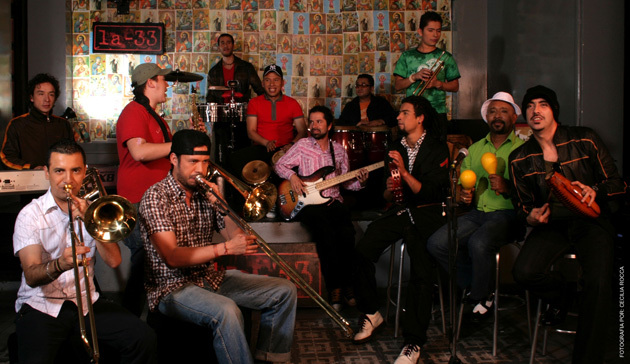 This year (2011) the Colombian band La-33 is celebrating 10 years of playing old-style salsa. After all this time there is an enviable balance for this salsa group. The band has recorded three albums, sold more than 40.000 copies independently, and toured many countries like Mexico, Venezuela, Poland, Morocco, Denmark, Canada, Italy, England, Ecuador, France, Spain, Germany, Japan, Slovenia, Czech Republic, Romania, India, Norway and the United States among many others. La-33 has performed in the most prestigious festivals in the world with salsa and Latin legends like Buena Vista Social Club, Alfredo de la Fé, Yuri Buenaventura, Henry Fiol, Cheo Feliciano, Chucho Valdés, Los Van Van, Joe Arroyo, Orquesta Aragón, Ismael Miranda, and Orishas, just to mention a few. Their songs are part of 20 compilations (including the prestigious Putumayo Records and Sony Music Greece), and several movies like “Paraiso Travel” and “Perro no Come Perro”. So far the band has played more than 1,000 concerts in the five continents and it is one of the few bands who sell a respectable number of CD copies monthly in store locations despite the mp3 download habits people have adopted nowadays. I met Sergio and Santiago Mejia at Tayrona, an amazing natural park in Colombia, nine years ago. I was unpacking my bag to start putting up my tent when I saw a skinny, bearded guy sitting on an old hammock playing a bossanova song with an old guitar; this was Sergio Mejia, the director of La-33. By looking at him I noticed right away that this was a guy who was passionate about music. A quiet guy came to join Sergio in the impromptu jam session. This was Santiago, his brother, the pianist in La-33, who had a Colombian drum to complete the unexpected concert with no other audience but me. That week, in Tayrona park, I listened to them talk about their salsa project, the La-33 band. Sergio gave me a copy of the first home-made album of his band. I could not wait to listen to it. I grabbed my portable cd player and started listening to it right away. I remember my expression as I listened to it. I was astonished by the unique sound they produced. Although I did like their style I was not sure if they would seriously record that album, sell copies and play in different places. My attitude was a reflection of the times; we were in a decade where classical salsa had almost disappeared because of romantic salsa and reggaeton. Thinking about producing classical salsa seemed like an anticipated suicide. I enjoyed those vacation days with the Mejia brothers and some days later we said good-bye and good luck. The Mejia brothers did not come from a musical dynasty. They were just like any other people who loved music and dreamed about being composers or super stars. Their father Humberto was really their first stimulus to feel music and start understanding and loving it. 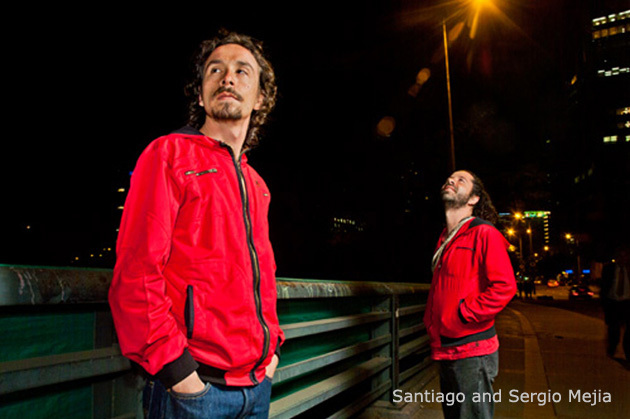 Santiago and Sergio were given a guitar and a tiple when they were seven years old. Humberto often played the organ with them close by and with their new instruments the Mejia brothers started their first set of simple gigs and jams. Santiago and Sergio’s parents were not a traditional musical family like many others in Colombia, but this was not a barrier to dreaming about going further in this difficult field. They were 13 years old when they started watching the concerts of famous American and Latin-American rock stars on television. That rock period was enough to encourage them to dream about being superstars. So the brothers started a classic rock band which played Led Zeppelin, Metallica and Soda Stereo’s songs. Their first musical studies were at a private musical school called Federico Chopin. After one year of musical studies Sergio’s father brought them an electric guitar and a keyboard and since then their discipline for exploring music has not stopped. While at the University of the Andes Sergio was part of a ska band called Sonora Cienfuegos, a kind of Latin ska band. He studied composition at this university for thirteen months. Sergio expected his teachers to teach him about composition but that did not happen, instead he learned more general ideas about music and composers. He quit the university program in the middle of the second year. During the last semester at this university he knew that he would leave this prestigious institution and start taking classes at Escuela Colombiana de Jazz (Jazz Colombian School). At the same time, Santiago started classes with the Cuban musician Eduardo Pineda, and the Colombian composer Ricardo Uribe. Santiago finished high school and registered in a graphic design program but he never stopped studying piano. At this moment Sergio began to develop an interest in Brazilian music and together they started listening to Colombian salsa groups like Fruko and other Colombian salsa musicians. This was their first foray into the world of salsa rhythm. At one point Sergio decided to go to Canada because he thought that nobody in Colombia could make a living by being a musician. While in Canada, he took classes and learned about how to compose jazz and rock. Ironically it was in Canada that Sergio found more Latin music material to study salsa than in Colombia, so he began to send this material to his brother Santiago who, by that time was in love with piano-style salsa and a new movement of music that came out with representative bands like Curupira. After being out of his country for some time, Sergio began to feel an increasing sense of what it meant to be a Colombian. He realized that being away from Colombia for some time only made him feel more Colombian. In the midst of the wintery weather in Canada, salsa music made Sergio feel very special because it was his company and a beautiful way to get over the loneliness at times. He felt somewhat incomplete when Canadian people interested in music asked him about Colombian music and he did not have a complete landscape to share with them. So Sergio decided after a time to come back to the land he knew was in his heart. Back in Colombia, in 2001, the Mejia brothers started studying Colombian folklore and decided to start a band. Their headquarters was the traditional house at 33 street in the Teusaquillo neighbourhood of Colombia. They remember how they started with Guillermo Celis, the bands’ vocalist, to perform classical salsa songs like “Sandunguera”, “Me voy pal pueblo”, “La India Catalina” and “Son de la Loma”. Sergio remembers how Guillermo introduced the musicians with false first and last names. After a bit of back and forth, the new band completed its members and started playing a lot for little money, but they didn’t care, they preferred to play, that was the deal. La 33, salsa band, used their music to express what was happening on the street. They believe that part of the success of the band is that they think out of the “square” interpretation of the salsa genre and propose a different way to think and play salsa music. To be from Bogota, to come from a non-Caribbean context and to have a rock background were really good advantages to reinterpret salsa, and this has been perhaps, the main hook that attracts people’s attention. La-33 offered people a different way to play salsa music. Playing salsa music in Bogota was a great advantage given that most salsa music hails from the Caribbean regions in Colombia. Santiago says: “The way you talk is expressed in the way you play the piano, it is the way you put emphasis on it, this is about printing your own label”. The band was created in a really difficult time for classical salsa music, La-33’s particular salsa style was a unique blend of 70’s styles like boogaloo and descarga, both of which were not particularly in fashion at that time. During these years, romantic salsa was the hit in any corner of Colombia. La-33 not only had to struggle with their style but also with the huge selling crisis that the general music industry was experiencing. The mp3 download software on the internet abruptly decreased in-store music sales. La 33 was so brave because they bet everything they had that 70’s style salsa could still be sold in a time when others thought it might be crazy. Sergio and Santiago started going to visit recording companies in Bogota to offer their demo but the answer was always a “no”. The managers of those records companies argued that the style was very out of date. These managers proposed to the Mejia brothers that if they produced tropipop (a mixture of tropical and pop music) they would have a chance to record. So after these negative responses the Mejia brothers got tired of knocking on doors and decided to invest all they had to record their first album independently. But it was only until May of 2003 when La-33 decided to present themselves to the Bogota audience as a formal band. The launch of their concert took place at the band’s branch, located at 33 street in the capital of the country. The first album carried the same name of the band: La-33. Ten songs composed (most of them) by the brothers. The amazing hit “La Pantera Mambo” (The Mambo Panther) was an adaptation of the classical jazz piece “Pink Panther”, the soundtrack of the unforgettable American cartoon composed in 1964 by Henry Mancini. That song was enough to put La-33 on the map in any place around the main cities of Colombia. By themselves, the band started selling thousands of copies in a really short time. The recording companies, which had rejected them before, began calling them to record and sign contracts, but it was too late, La-33 was not interested in having any relations with record companies – they were already independent. The album was constantly selling copies in many places, few bands were doing this. Two months after the release, the song “La Pantera Mambo” turned into one of the most popular songs in Japan and Italy. Before they reached the prestigious musical charts, the group played in downtown places in Bogota, but when their success flourished the band was offered to play in the most prestigious and fancy places around the city. What is really remarkable about this salsa band is that they achieved to put “La Pantera Mambo”, without paying one cent to radio stations, in the top as one of the most important Latin songs in the country. Listeners persistently called local radio stations to request the song, so much so that there was no other option than to play it, turning “La Pantera Mambo” into a song that could be heard in any part of the city. The same happened to “Manuela” another of La-33’s songs which was a hit in Cali, the capital of salsa, where it was played for more than 13 weeks on popular radio stations. Their hits allowed them to start playing in many places frequently. This situation was incredible because this classical-style salsa band was taking the place of romantic salsa ones around the country. Several years passed before the second album came out. The Mejia brothers think that music is not necessarily about producing an album each year, it is more about feeling the music and composition, and letting it go with the flow, according to them, an album has its own rhythm to be created. 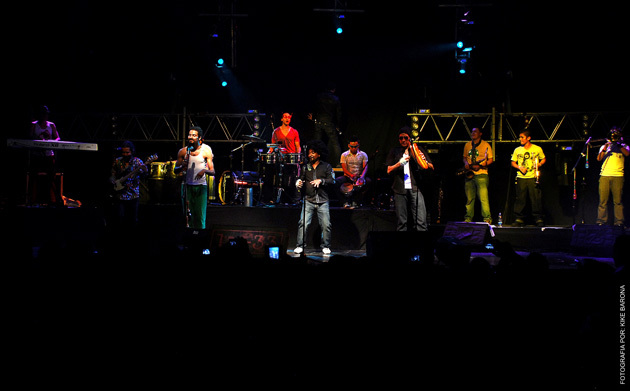 In 2005 the band was invited to the popular salsa festival “Salsa al Parque” in Bogota, the perfect place to show critics and spectators their talent and commitment to this genre. That same year their only album was considered one of the best albums by the Colombian magazine Semana. From that year on, they began nonstop tours around the country. During the same time, the band traveled to Cali, the paradise of salsa music, where they performed in an event called, the 1st Encounter of Collectors, in the working neighbourhood of Cali. Later the band was invited to Quito, Ecuador to play at Seseribó, a salsa temple in that city. The success of La-33 was unbelievable. Everybody was talking about it. The songs on this album were being played in cafes, clubs, discos, and even shopping malls. 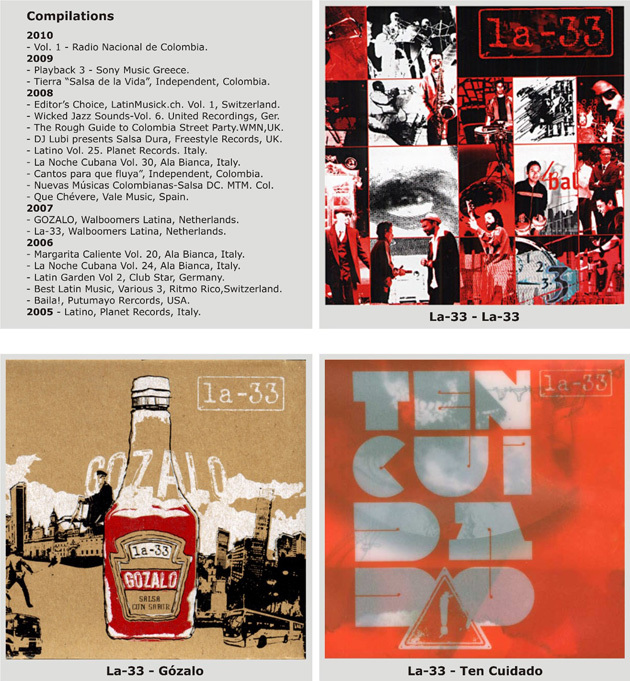 By 2006 La-33 had a busy schedule playing in places all over the country and for the first time the band went to Europe to present its show at three festivals; Latinoamericando Festival, Pole Pole Festival and the Antilliaanse Festival. Enjoy it! Just play it! In 2007 the second album “Gozalo” (Enjoy it) was released. With this work La-33 kept its particular sound, built upon classical rhythms like descarga, bomba, montunos, and boogaloo. To this album, the Mejia brothers added fusions with porro, cumbia, and latin jazz. The opening song is called “Descarga”, a fast-beat song which reminds us of the sounds of Joe Cuba in his best moments. The refrain is absolutely catchy, “La descarga me llama” (The descarga calls me), full of flavor and color. Each song in this album has something unexpected, for example in the powerful “Quiereme Na’ma” (Love Me, Nothing Else), the trombone played at the same time as the pregon, by the vocalist Pablo Martínez, produces an emotional and touching result. The piece “Plinio Guzman” makes us remember the genius Colombian composer Lucho Bermudez, this song is an exquisite musical artwork with many elements from the Colombian rhythm porro. The influence of Latin jazz is obvious when you listen to “La tormenta” (The storm), “My Favourite Things”, even “Gozalo” (Enjoy it). Long solos of brasses and percussions are part of these songs. With a new album in place the band increased the number of tours. During this year La-33 was invited to events like Festival Weltnacht, Festival Oye Afrika, Salsa Festival Torino, Mediterraneo Festival and Latin Village Festival among others. For the second time their work was enlisted in the best records of the year in Colombia. La-33 is very united in terms of rehearsals and processes of composition. Normally the Mejia brothers bring to the rehearsal the structure of a new song. They often collaborate with the other musicians in the band so that their songs are composed together with their other band members. David Cantillo “Malpelo” is a creative singer who loves to participate in the process of composition and has found in this band the possibility to express his musical ideas. Each musician adds a special ingredient to the project. Some of them have a strong rock and roll, metal, funk and tropical background so they infuse their style into what they play, and this makes the band sound absolutely different constantly catching people’s attention. The timbale, for example, shows a lot of patterns used in rock and jazz and the piano breaks the classical tumbao pattern to make blues and soul lines. In 2008 the band had an insanely full agenda. La-33 had concerts in many countries in Europe and Asia, presenting their show in the most prestigious festivals like Tempo Latino Festival, Amsterdam Roots Festival, Varsovia Salsa Festival and Fête de la Musique, just to mention a few. For the first time the band toured 8 cities in Japan. More and more festivals were part of La-33’s life. Having so many concerts to perform did not allow the band to produce more albums but they were always aware they had to keep working hard because people in many countries wanted more La-33. 2009 was the year the band released its third album called “Ten Cuidado” (Be careful), a work which went back to the pure roots of the old-style of salsa, what some have called the “salsa dura” (hard salsa). This album is a return to the social message that music in the seventies had. The song, which has the same name as the album, is a good example of the intention to touch the mind of the listener; it is an instrumental piece with a great percussion structure, particular elements of flamenco and a mix of New York and Puertorican piano lines. In this opening song it is not necessary to have a completed lyric to understand what the message of the song is about, the refrain “Be Careful” is more than enough. Maybe one of the most socially profound songs is “Conciencia Intranquila” (Unrested Conscience) which talks about fairness and society and uses the voices of social leaders as part of the background voices in the song. This album showcases the band’s like for boogaloo with two zesty songs “Funky Boogaloo” and “Mambo con Boogaloo”, musical pieces artistically played, enhancing this particular sound. But not only the boogaloo is honoured in this album, the classical salsa songs complete this work. “Salsa Resucitó” (Salsa resuscited) is a symbolic song full of melodical richness coming from the bass and the piano, the instruments played by the Mejia brothers. Continuing with the famous “La Pantera Mambo” the band recorded a salsa version of the well-known Sting’s song “Roxanne”. To record a song composed from another genre is always a risk because nobody ever knows what to expect. In this case the result was an moving interpretation performance by Pablo Martinez who infused the song with his high vocal tones and bluesy voice accompanied by a wonderful strong Latin beat arranged by Sergio who started this piece with a bolero, almost a ballad song, which slowly turns into a montuno and ends in an exciting descarga full of emotion and vibrancy. This same year, the band continued playing in Europe, this time visiting new countries like Finland, Switzerland and Norway. La-33 was invited to more and more festivals like Roskilde Festival, World Village Festival and Jazz Sous Les Pommiers Festival among many others. The Mejia brothers think that three albums are a small amount of productions for a band which has toured more than any other in recent time in Colombia, but they are convinced that each album comes with its own rhythm and each song needs time to be ready to be composed, recorded and played. Santiago and Sergio are not worried about the length or the “catchiness” of the song, but about making music in a pure and free way, letting the sound and poetry come to them, for them this is the essential part of the musical creative process. The name of the band is mentioned on many other prestigious music stages. In 2010, La-33 performed in the Great Concert of the World Bicentenary in India. Sooner or later Sergio had to go back to Canada to reencounter what he had left behind ten years ago, a land which had showed him how beautiful Latin music is. This time his reunion with Canada was not to listen to other musicians, but to show what he himself had learned since his first encounter with the colossal country. This time around in Canada, La-33 performed on some of the most prestigious stages, Harborfront Centre and the Montreal Jazz Festival. The rest of North America now had the chance to see the creators of “The Pantera Mambo” watching, listening and enjoying the descarga of these Colombian musicians in places like Sunfest and the Jay Pritzker Pavilion Stage in Chicago. That year La-33 received two Shock awards both associated with being the best band. The Mejia brothers do not like when people refer to them as “famous” because they don’t think that they are. For them fame is a dangerous game where ego can win and put people down. They prefer to be normal people, people who go to the little store to buy simple things. They know how fame can turn out and because of this they try to maintain the life that they had before La-33 came about. They think that taking advantage of fame is nothing about being a real musician; music is more than popularity and money. La-33 is working on a new album without any rush. They are independent and want to live that way without any kind of pressure. For now, after many concerts in different cities around the world including the Globalfest in New York, the band has achieved one of the most incredible outcomes a salsa orchestra can get; La-33 was invited to be one of the artists to record an album to pay tribute to the most representative salsa composer of all time, Tite Curet Alonso. This big project is sponsored by the Banco Popular de Puerto Rico, the same who produced the famous DVD “Encuentro” which brought the legends Ruben Blades, Juan Luis Guerra and Robi Draco Rosa together on the same stage. For Tite’s tribute the song chosen by La-33 is “Marejada Feliz” which was already recorded in San Juan and is now being mastered, an album that half of the world is waiting for. One day, ten years ago, the Mejia brothers decided to create a band to play salsa in a different way. Years later I met Sergio again to know about the details of that dream that he had vividly spoke about when he was in that hammock in Tayrona Park, playing a montuno with his old guitar, in front of the sea. “I love to say things but in a constructive way, we, as Colombians, always criticise but we do not do anything to change, we have to say it but to propose something at the same time” says the director of La-33. Sergio, Santiago and La-33 will continue expressing their music in a constructive way giving salsa lovers a vibrant and touching sound, full of a particular taste in this rebirth salsa style. I do hope to see this project on the scene for many, many more years to come, constantly inspiring others to create and express. As La-33 says, “Gózalo!”, Enjoy it!